Can you imagine a way of solving problems without discussion? As a team of software engineers, we are facing issues that need instant solutions. To get the right answers, we are practicing different approaches every time to find the most suitable course of action. Then, we have long-lasting discussions to find the solution. Sometimes, they can be so unstructured and very time-consuming. 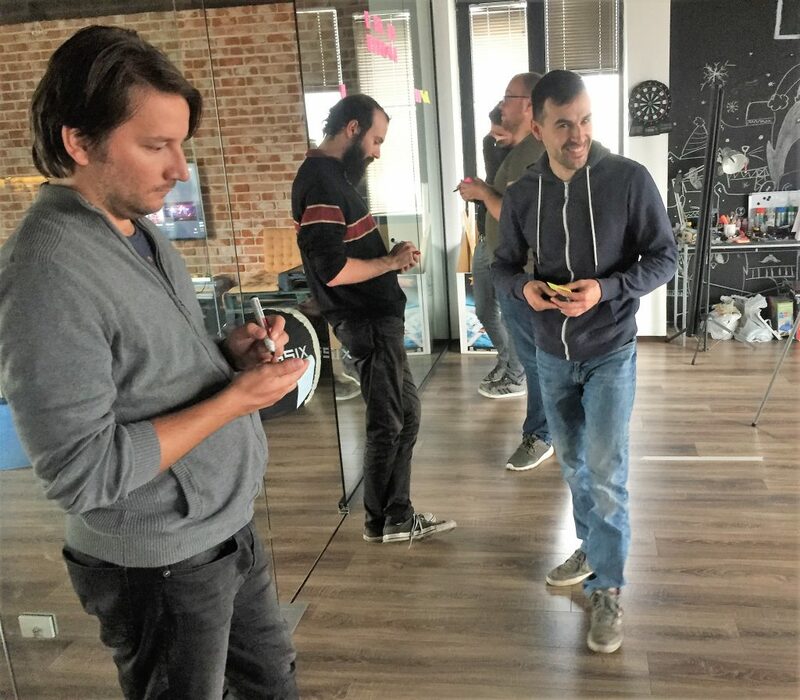 Luckily, we’ve met Kamil Barbarski, who acted as our workshop moderator during one of our TechTalks Thursdays’ event. The exciting and practical workshop is Lighting Decision Jam. It aims to find and test solutions to our everyday challenges in the working environment. Kamil is an entrepreneur and innovation hacker who firmly believes that we should focus our attention, time and money on what’s essential for ourselves and others. He is also a trainer and coach who teach corporate executives, employees, and entrepreneurs how to use the innovation hackers mindest, tools and methods. 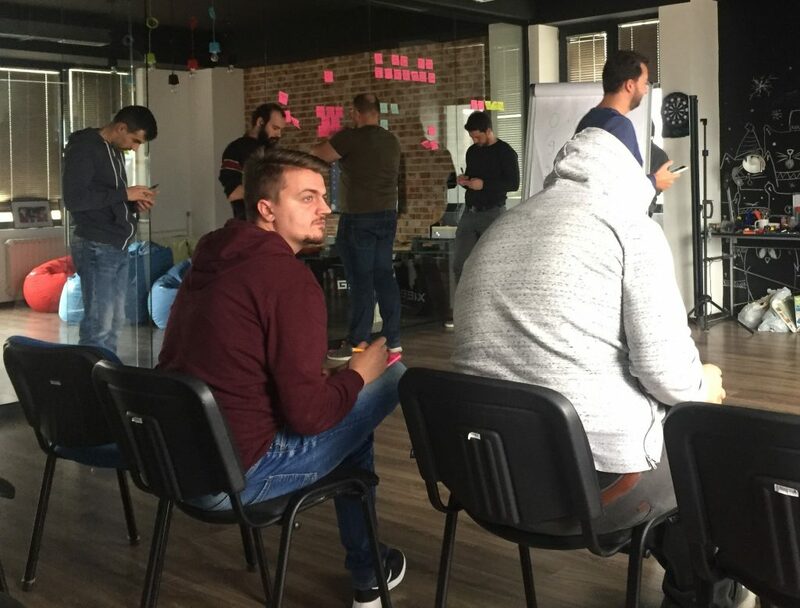 Kamil helped more than 200 innovation teams and startups to bring new ideas to life – 10x faster than with regular processes. Barbarski has been a mentor at Google for 2 years and in his experience and he co-founded and sold one company. Currently, he is actively involved in the role of innovation hacker at kamilbbs.com – his lastly founded company. He spent two weeks in Macedonia as part of the Entrepreneurs-in-Residence program and we were honored to have him as a guest in our offices. It is a fascinating name for a workshop which reflects even more exciting agenda and even more short-term results for long-term goals. All you need is a group of people on in the same league who will identify problems from all possible angles. Implementing all the steps described below will lead to generating solutions. Afterward, it’s very easy to set action points and test out the results in the very next week. 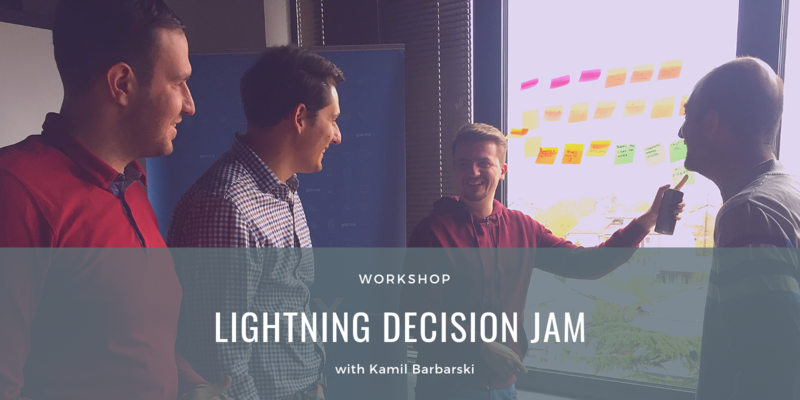 In the next few paragraphs, we’ll briefly describe our experience with running a lightning decision jam under the moderation of Kamil Barbarski. After grouping up, we’ve set the general subject to be “everything organizational and technical”. Then, we had exactly 7 minutes to generate many issues as possible and all alone. Kamil ensured a good thinking mood by playing silent and calming music. Since there are no wrong answers, we’ve written down on sticky notes all possible issues that come up in our mind by placing them on a wide wall. In the next 4 minutes, each presented the problem to the rest of the group. Afterward, the moderator gave us 6 minutes to vote on the 2 problems we should focus by placing sticky dots. The most popular sticky note wins. If there’s a tie-break, pick the one on the left. At this moment, all the groups have chosen one problem. Then, the moderator asked to rephrase the problem with the question: “How Might We?” and think of potential solutions, which lead us to the second stage. Just like previously, but now we were focused on creating solutions for the winning problem in each of the groups. We were doing this quietly and as the outcomes come up while thinking how might we improve, reduce, solve or eliminate the chosen problem. Rephrasing the problem with this question enables quick reasoning of possible outcomes. Then comes the voting stage, but instead of placing two dots, this time we have 6 votes to distribute to the favorite solutions by having no limitations of how many should put on one sticky note. After voting, here comes the final stage of the process. The voted solutions are placed on an effort/impact matrix. When placed, we were able to think and see which solutions seem easiest to achieve with most effects. The matrix provides a clear and visual view of the solutions ordered by requesting effort and given impact and we had 5 minutes to come up with 3 actionable steps toward testing the solution in a given timeline of 1-2 weeks the most. We drafted actionable points to test the solution. The idea here is to start a small portion of the solution immediately and motivates people to get started. We found that practicing LDJ gets everyone on the same page while we are working alone, together. Moreover, tt also reduces the group thinking and we can share our genuine concerns. It is all about problem-solving without overthinking and long discussion. Do not discourage if the solution is not working after some time. Not all solutions will solve the problems. In a short period, we can define crucial challenges, think of potential solutions and prioritize what to execute with a minimal amount of discussion! Finally, the thanking part goes to Swiss Entrepreneurs in Residence program who powered the attendance of Kamil at GSIX. Kudos to Kamil Barbarski for being an outstanding workshop moderator! Let us know if you’ve tried Lightning Decision Jam with your team!